Christmas – Give where it matters most. Warning : Very long post with religious stuffs. In a gist – Why buy so many presents for so many people? Why not do something for the less fortunate, instead? Now, call me a scrooge or whatever but I don’t go out of my way to buy Christmas presents. Yeah, my kids do grow up with ‘Santa Claus’ dropping lots of gifts but they have reached an age where Santa’s origin is explainable. The only two gifts I will buy this year are for my godmother and Auntie S.
My kids had a nice time at the St. Joseph Home today. Songs, games, gifts and lots of foods. About 30 of us, the Cathedral of the Holy Spirit choir members volunteered our time (and melodious voice which puts the smaller kids to sleep!) whilst another group of kind hearted people finance the event including catering the food and gifts. 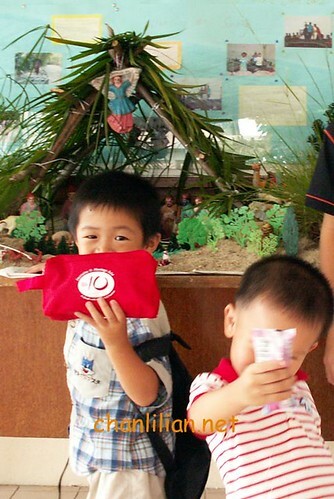 I did not take photos of the faces of the cute little boys and girls there because I feel it is not right. Sort of invading their privacy. But I hope this pic tells a thousand words. 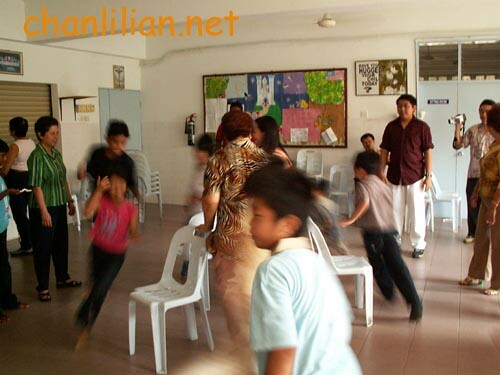 See how happy these kids are running around, playing the musical chair? I really like this photo because they moved so fast, shrieking with excitement and thoroughly happy with the prizes they get. I am deeply touched with the dedication of the members there who totally immersed themselves in keeping the kids entertained. They ran along with the smaller kids (below 5 years old) to keep them safe. (sorry, I where got time to do that? I chase my own toddler also ‘chuan’ liao la.) The kids really had a good time. So, good people out there. Instead of cracking your head what to buy for your gf/bf/ex-bf/spouse/mil/colleagues/etcetc, why not use the money to buy gifts for those less fortunate? I know there are lots of little boys and girls (old aunties and uncles too) out there like CK who probably will appreciate gifts more than us. Go on, bring a smile to these people. 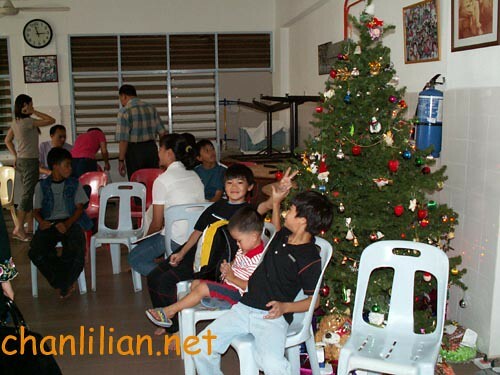 Call up a shelter home/orphanage/old folks home near your area, find out how you can help. It doesn’t have to cost much. I bought some really cute candy canes for a mere RM20 and the kids love it! Christmas is a season for giving. Giving love. The below is copied from Google cache page on St. Joseph’s Home. I am pasting it here for the record as I believed the original website maintained by The Lions Club is not working anymore. A hundred years after the founding of Penang by Captain Francis Light, Penang remained very much a land of promise for the daring and the adventurous from all parts of Asia. It was also a land fraught with dangers. The early immigrants from India, China and the neighboring countries to Penang were plagued by sickness and diseases – typhoid, cholera and malaria, the three main killers. Children of all races and creed were left orphans to fend for themselves with the sudden demise of their parents. A French missionary, Fr. Hab saw the needs of the time and founded St. Joseph’s Orphanage in 1865 with 20 orphan boys. Through the years, the Orphanage has grown and today, it is managed by a Board of Management in partnership with the Staff. With changing trends in society in the nineties, and the rise in problems faced by families, there was a need to expand the services of the Orphanage in order to be more responsive and relevant in society. Hence St. Joseph’s Orphanage opened its doors to include not only orphans, but also to children of all religion and ethnicity who come from very poor socio- economic and psychological background. Thus, St. Joseph’s Orphanage became St. Joseph’s Home. By LilianIn FaithTagged Life rants12 Comments on Christmas – Give where it matters most. Previous Previous post: Name me five Christmas songs and I will sing it on my blog! Last year, I participated in MPH’s Give A Book program where you buy a book for a kiddie in a shelter and MPH will send it to them gift-wrapped and with a message (which you write too). It was something interesting. On the side note, the bf’s family has an interesting and noteworthy policy when it comes to Christmas. They draw names from a bag and each person has to give a gift to the name they drew. That’s it. Why? Because they don’t want to promote materialism. Christmas, to them, is all about coming together as a family and having a good time NOT gifts. Hi Lilian, there is a christmas wish tree at Kenny Rogers with cards that have names of the children and what they wish to get for christmas. The children are from St.Joseph’sHome. You just need to buy the item written on the cards and pass the gift to Kenny Rogers and according to the staff, they will hand them over to the orphanage before christams. Hope they are trustworthy! musical chairs! i luv dat game! My RCS team will be having a christmas bash for the children in GH and in the children protection home.. so its going to be busy busy busy getting the preparations ready. I totaly agree with you. That is a wonderful way of celebrating events. simon – You so old liao, how to play? Break the chair nanti. foodcrazee – Yeah, this is the first time I visited a shelter home. (red face) The place is really cosy, spacious, equipped and nice. It was in the news not long ago that this place was burnt down. Later on, the church tried to exhume some neglected, very old, unidentifiable graves to make space for the kids playground but received a lot of heat. Jennifer – Hahaha, I did not know Kenny Rogers still survive in Penang. Where is the outlet? ‘Cos I know the one in One-Stop is closed. I suppose in good faith, they will fulfil their commitment. The kids there are so well-behaved and polite and so loveable! Mei – That’s a good idea. This saves the headache of buying gifts for everyone, ya? Adam – Yeah, it is very fulfilling to know that they enjoy it. neeshen – Hey, you need volunteers? (put up hand) Seriously, if you do, can you email me? I can ask my breastfeeding group moms if they like to help out. my goodness! it is a long post, GOD bless you lilian! I have 40pcs of Aluminium Tumblers and some children stationary set that I wish to give away. Can I bring them to St Joseph House before Christmas? Does St. Joseph’s Home have an e-mail address?